ATTENTION! When using any source from this site, www.ossetians.com MUST be cited in your work! A dominant athlete of the world wrestling’s new generation. Weight Class: 85kg, 96 kg. - European Champion (2003, 2004). In 2003 he was pronounced the best wrestler in Europe. Khadzhimurat Gatsalov was born in Chikola, North Ossetia. It is amazing that this Ossetian village in Irafsky District became a birth place for 2 Olympic Champions, several World Champions and runner-ups, as well as several winners of National championships! K.Gatsalov graduated from North Ossetian State University. Since 2001 competes for the Russian national team. 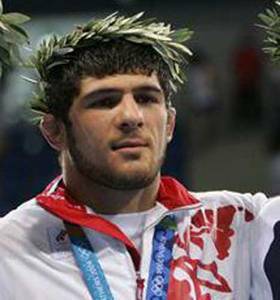 “Russian Khadjimourat Gatsalov clinched the men's 96kg freestyle wrestling Olympic gold in Athens on August 29, afternoon, beating Magomed Ibragimov from Uzbekistan 4-1 in the final. 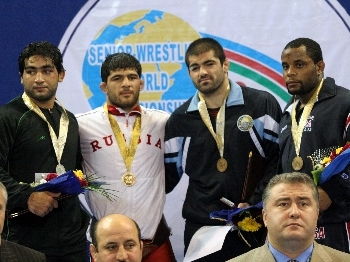 “Cormier was defeated in the semifinals by European champion Khadjimourad Gatsalov of Russia, 5-0 in overtime at 6:08. Gatsalov scored a takedown in the first period for a 1-0 lead. In the second period, Gatsalov added a single leg takedown for a 2-0 lead. Regulation ended at 2-0, and the required three points had not been scored. From the clinch in overtime, within eight seconds, Gatsalov was able to take Cormier down to his back, scoring three points for the 5-0 win. This outstanding wrestler keeps going forward on his victorios way. In September 2005 he won his second World Champion title.